Children love gross things. I remember my childhood friends and I trying to top each other when it came to slimy, muddy, nasty things. And of course, the childhood jokes that started, “What’s grosser than gross?” where you tried to come up with the most offensive, horrid creations and scenarios to evoke a ghastly response. Well, Sweetie is falling right into line. My sweet little daughter gets a kick out of gross things, particularly with things that involve the body. It’s like her morbid curiosity mixes with the reaction of her parents to give her a sense of accomplishment. For the past week she has been dealing with a cold and has lots of nasal congestion at her disposal. We of course tried to teach her how to blow her nose, and she learned. She just doesn’t always reach for a tissue. Why bother when Mom and Dad are conveniently close and always willing to help? 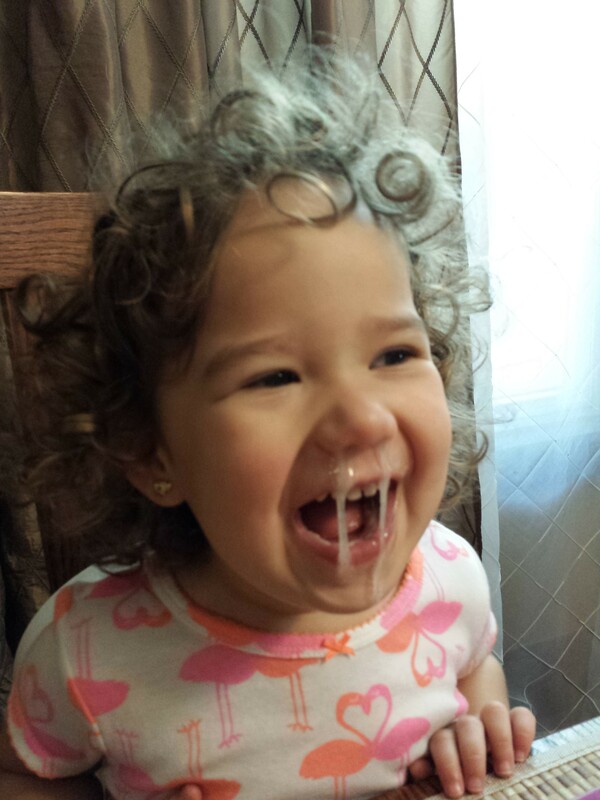 So we deal with these “snot stalactites” all day long, much to her delight. When I told Captain Jack about this he thought it was hilarious and immediately asked for a picture. I tried to explain I was usually too busy grabbing a kleenex, not looking for my phone. But today we were ready (the cold is almost gone, and so is this moment). On a good note, at least she is getting the mucus out of her head. And for the record, Wife thought I shouldn’t post something like this. But doesn’t it just scream, “man – kids are great!” Yeah, that’s my little girl. If I had sons this would be a humorous post. But as the father of two daughters, I think it is just funny. Don’t fret, stories and pictures of the newbie are coming. This just went down and I wanted to put it out there. Sweetie, our oldest, is just about two-and-a-half years old. We started potty training in July and have met with an appropriate amount of success. But nothing is perfect in the early days. Today when we returned from the grocery store, Sweetie announced that she had to pee. We’ve trained her to tell us and to get herself to the bathroom, which she did. The fun began when I went in to check on her. As expected she was sitting on her training toilet with her pants down around her ankles. She rose up to a squat to show me how well she had peed in her training toilet. When I asked if she was done she said,” No, I go more like this,” and calmly continued to pee…all over her legs, pants, undies and floor (yeah, not a single drop hit the toilet). That started off the afternoon with a wardrobe change. Oh well, I can’t really call it an accident. I guess it was maybe more of an experiment on her part. I explained that little girls need to sit down to pee. I figure she can learn more advanced techniques when she is out camping or on an emergency roadside stop – pretty much anywhere but standing in the middle of my bathroom. I don’t make it a habit of standing up to pee in front of Sweetie, but it happens. Apparently she just wanted to go to the bathroom like the adults (for the record, Wife does not stand to pee). Good stuff, eh? And just think, you got to enjoy this potty break story without having to clean up the bathroom floor.